Moving heists from inner city banks and casinos, Starbreeze Studios are travelling back in time for their next game. 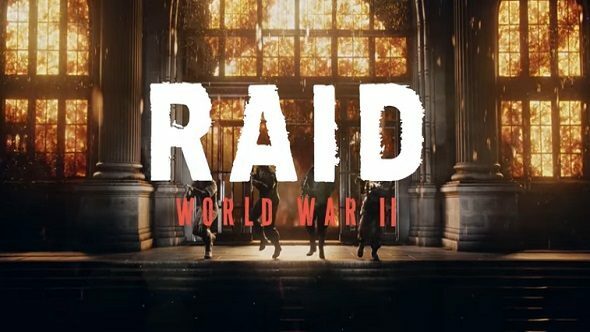 Developed by Lion Game Lion, a team of former Overkill staff and creators of the Bomb Heists DLC for Payday 2, Starbreeze have shown off a new cinematic trailer for RAID: World War II, a four player co-op game which has players stealing as much Nazi gold as they can get their hands on. If you want games to play with friends, check out these PC co-op games. Set during the dark days of World War II, when the Nazis were steamrolling across Europe, RAID: World War II has players tasks as a resistance group whose only goal is to disrupt the fascist war machine in any way possible. From the cinematic trailer, this involves stealing, murder and wholesale destruction of property, preferably using a lot of dynamite. Based on the screenshots that are available for RAID: World War II, it will play a lot like Payday; roll up to the target location, clear out any resistance inside, seize any valuables that aren’t nailed down and then scarper before the Gestapo turn up. The end goal could be different, as the trailer shows the merry band of Nazi smashers blowing up the bank they raided and preparing to gun down those take came to deal with them. Besides clearing out vaults of Nazi bullion, the missions in RAID: World War II are planned to be based on actual combat scenarios from World War II, so expect to be blowing up radar stations, disrupting supply lines and generally giving Mr. Hitler a good old kick in the shins. Your team of Allied raiders certainly likes to play dirty, so prepare to lay some devious traps for the Nazis. RAID: World War II is set to release this summer.